Greystones017687 73108work017687 73108fax Guest AccommodationGreystones Guest House in Keswick enjoys an enviable, quiet location, with splendid views of the surrounding mountains yet is only a few minutes' walk from Keswick town centre with its many shops, cafes, restaurants and traditional pubs. 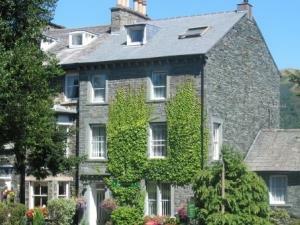 Built in 1863 using the most handsome stone from the local Honister slate mine in Borrowdale, Greystones now offers high quality accommodation in the very heart of the Lake District. Comfortable rooms, guests' sitting room, a friendly atmosphere and a superb breakfast menu (including vegetarian options) are all combined to create an excellent place to stay. Whether you travel to the Lake District to walk the fells, absorb the atmosphere or simply want to relax, Keswick is 'the' place to stay. Often described as the 'Jewel in the Crown' of the Lake District, Keswick is situated between the two lakes of Bassenthwaite and Derwentwater and surrounded by the most majestic mountain scenery.